In the event of a disaster, you’ll want to make sure that you have some means of cooking the food that you have hopefully stored. The good news is that, if you have a natural gas connection to your house, your natural gas stove (and outside grill if you have one) will continue functioning just fine. I have experience numerous electricity outages over the past few years, but not a single natural gas outage. You will have to light the range with a match as the automatic igniters require electricity and you probably won’t be able to use the oven (unless you have an older model with manual rather than electronic controls). The reason for this reliability is that the natural gas pipeline operates under high pressure and that pressure is maintained by compressors along the way which actually run on natural gas and do not require electricity to keep the pipeline functioning. Nevertheless, a sustained power outage would likely cause shutdown at the central command centers, which could impact service, and additionally, there’s always the possibility that the disaster situation could involved damaged pipelines. Also, not everyone has natural gas, and obviously an electric range won’t do you much good in the event of a power failure. That brings us to backup stoves. There are a variety of camping oriented stoves that make great home backup stoves. They are also portable, and can easily be taken with you in the event you need to evacuate. Stoves run on different fuels, some being designed only for white gas (AKA Coleman Fuel), some for kerosene, some for propane, some for alcohol, and finally, some are designed for multi-fuel use. In general, stoves designed for white gas can also run on automobile gasoline and stoves designed for kerosene can also run on diesel, though neither is really recommended as it will produce a fair bit of smoke and stink. Kerosene is one of the best fuels for a number of reasons - it stores much better than gasoline, is less dangerous than gasoline or propane, and can also be used in heaters. My personal favorite backup stove is the Optimus 111. There are several different models to choose from. Optimus made these stoves for decades and they were used by the US Marines, Swedish armed forces, the US Antarctic Program, and campers around the world. They are rugged bulletproof stoves that will provide a lifetime of service and beyond. Sadly, Optimus no longer makes them, though there is a ready supply on eBay and through other second hand sources. A quick rundown of the models is as follows: 111 - kerosene roarer burner, 111B - white gas roarer burner, 111T - triple fuel (white gas, kerosene, alcohol) silent burner, 111C - multifuel silent burner (update of the 111T). Of these, my favorite is the 111T. The burner and fuel tank are mounted in a steel clamshell case measuring approx 7″X7″X4″ and weighing just under 4lbs empty. 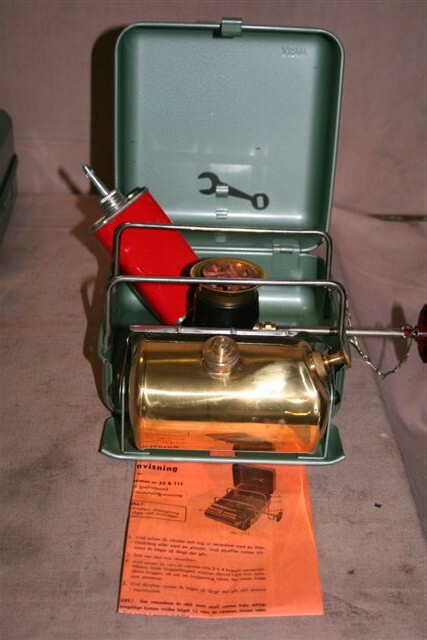 You can learn all you care to know and more, about classic camping stoves over at http://www.spiritburner.com (collecting stoves is fun and addicting). In addition to having a backup stove such as the one above, don’t discount the usefulness of a natural gas, propane, and/or charcoal grill for cooking outdoors. This entry was posted in Food storage and cooking. Bookmark the permalink. Post a comment or leave a trackback: Trackback URL. Good article, but surely it would be better to be independent via wood / multi fuel stoves? I think most people miss that point you made in the beginning of the article. It’s a shame, but sometimes people don’t have a plan for the worst, which is not the way to go. Camping stoves are excellent back up plans for disasters or when as you mentioned the electricity goes out. You never know and not having a way to cook food can be dangerous if the occasion is stretched out. The Optimus 111 looks pretty sweet. I’ve never seen one before until your post. Nice suggest looks like it’s pretty durable and dependable.